It’s been too long since my last belly picture (with the first, I took one every week! Ha, this one gets on like once a month)! I thought I’d get one. I’m at 24 weeks now and this little girl is a wiggly-wiggle worm. It feels like she’s laying differently than her sisters, too. More like laying across my belly then up and down. It’s too early to worry/question it, but it’s strange that she feels so different. And, I thought the baby needed some loving, too. My face isn’t in it (bummer, too, because my hair’s looking pretty good), but I’m pretty sure she’ll know it’s me! 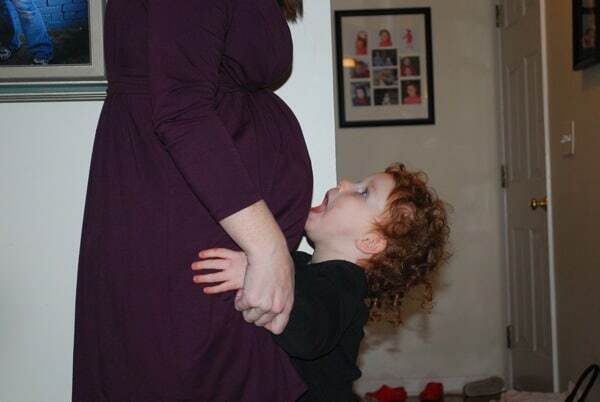 (This totally reminds me of #1 giving me belly kisses when I was pregnant with #2. Adorable). Daddy was snapping away, and she leaned in for a big, big kiss. I think she needed some momentum. And then laid a big one on her sister! For those of you asking…yes, we have thought of names…well, a name. But, we aren’t sharing! We are super mean like that. We never shared with the first two, and even though we found out that she’s a girl, we’re still keeping her name a secret. But, you know, if you want to send something monogrammed, I might compromise and give you initials! do you know ever since you told me she was a girl i have been trying to remember back to our name conversations. and i am one hundred percent sure you shared the next possible baby girls name and for the life of me i can’t remember what it was!! ugh. must start those old people brain booster games asap!! Oh, yeah..I think she thinks it’s funny when she’s rough like that! That’s exactly the reason I do this! I had to go back like 4 months to find a picture of me with my girls a while ago and I didn’t like that! 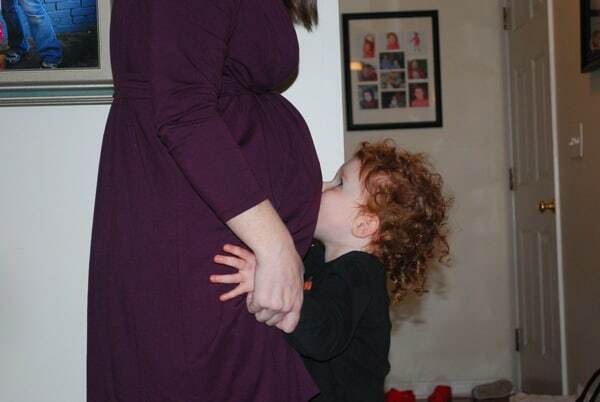 Your bump, her kiss, and that gorgeous curly hair of hers, all so very sweet. Awww…thanks! I think it’s her that really makes it cute. I never took any belly pictures with my two first ones, that will be 20 and 18 years ago. No one did at that time, at least here in Finland and of course I can live with that, but I wish I had some. So with the 2 year old I have lots and lots, with the 0 not that many, but I’m sure thee can never be too many. Enjoy the possibility to take them again! Thank You Krystyn once again, for the challenge. I wonder if anybody here did them 18-20 years ago? Nope, there can never be too many pictures! I’m so glad you’ve been joining in with us. We have baptisms here, as well, but I wonder if it’s the same thing. I think with some religions here, babies get a different name at their baptism, and then have a given name. Totally not an expert, though! She’s definitely a real character! I love the little kisses! Awesome!!! Audrey was too young to do that when I was pregnant. I was a little sad that I didn’t get any photos of her kissing my belly. Bummer! How close are they in age? Iz did it for Nat, but she didn’t have any idea what she was doing! Thanks, Meagan. I sure hope they look at it like that! Thanks, Jen. Gotta give the credit to Mr. Serious! SO very adorable! I love how she throws back her head then plows forward for the kiss! Unfortunately, it doesn’t feel the best! HA! OMG, please fix my triple-post! My bad. So sweet that she’s giving such big kisses! Yeah, I think she was thinking it was a little funny, too because she was jamming her face into my belly. Just melts my heart…. Many blessings to you…. Thanks, Holly…when she is sweet, she melts mine, too! Love the pics…love’em! But really, it’s that curly red hair that tugs at my heart. I love it! She loves her little baby sister already! Oh, she totally does. Pretty sure there isn’t a day that goes by without mentioning her.